I like to cut and paste: Great Impressions Friday Fun-Spooky! I love this house! It is stamp F561 Haunted House and the greeting is A134 Halloween Greetings. I used an embossing folder by Tim Holtz on the paper strips behind the house. The paper I used is from Core'dinations. It has an orange core and it is black on top. The gems are from Mon Ami Gabby. And the 31 is from a Tim Holtz mover and shaker die cut. The papers are from DCWV. Thank you for stopping by! 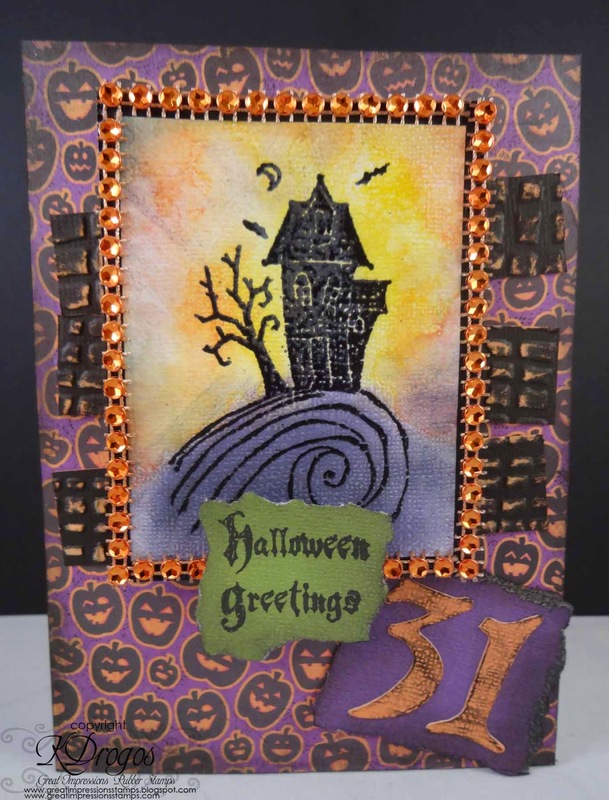 If you are making Halloween cards be sure to link up to the Great Impressions Challenge-Get Your Spook On. And be sure to check out our Facebook Page and our Pinterest Boards. Loveeeeeeee this! I loveeeeee the house and the bling!!!! what a fun Halloween card.. love the jews..